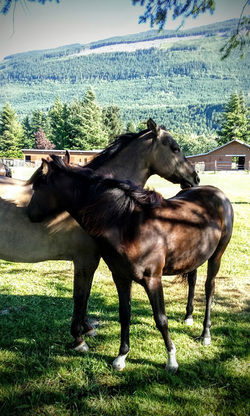 Breezy Valley Ranch is a private facility providing customized care for your horse. 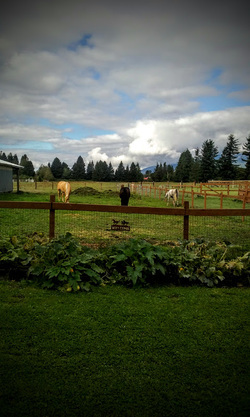 The ranch sits in a lush valley on 28 acres in the North Cascade Foothills, just 12 miles east of Sedro Woolley, Washington. The property is surrounded by beautiful snow capped peaks, evergreen mountain sides and grassy pastures. Features include a well lit indoor arena with a viewing deck and seating area, large mirrors and sand/dirt footing. Four large sliding arena doors can be opened to let in natural light and the beautiful mountain scenery. There's also a 50 foot round corral with solid paneled walls. Just off the west pasture, you'll find the Cascade Trail-- ride along the Skagit River, over scenic bridges and into town. We are located just 2 miles east of the Harry Osborn State Forest/Les Hilde trail head and a mile from the Baker Lake recreation area turn off where you'll find numerous lowland and alpine trails to explore. The North Cascades National Park which features numerous stock camps and trails is just up the highway. If you're looking for ease of access to some of the best trail riding the country has to offer, facilities for year round riding and exceptional care for your equine friend, this is the place to be.